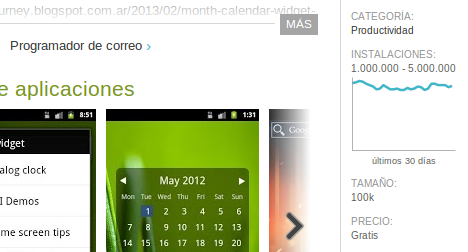 Yesterday Month Calendar Widget surpassed the 1 million download mark! Thanks to all who downloaded it and gave feedback. Specially to those who sent emails and waited a lot for a response (that times are gone, recently I took the good habit of answering pretty soon). What's next? Right now I'm finishing details of version 1.4.0 which will bring more adaptability to the myriad of different screen resolutions and sizes in the Android world, while paving the way to future enhancements that will take advantage of new Android features and also will allow more widget customization. Hi Month Calendar Widget users, great news. Since today I'm allowed to reply your reviews in Google Play. I cannot promise to answer every review, but I always read all of them and will continue to do so in order to improve the app. Please make sure you read carefully the app's description before posting your review, and also when possible use kind words ;). By the way: Spanish is my mother language, and I know English and Portuguese. I will answer in English when receiving comments in other languages.